This post is well overdue I know, but I’m posting it because in a few days, months and years time I know it’ll be a joy to reflect back upon. If you haven’t met Isa Mikaeel before I introduce him [here] and talk about the struggles and hardships I have experienced [here]. Now, this post is a quick follow up from there. Isa, Alhamdulillah, is great and doing well – except for the nasty virus that’s been going around as we both seem to be getting ill on and off since December! He’s had a constant cough and wheezy chest for a while now but he had a doctors appointment yesterday so all is well. Except his teething journey is just beginning so he’s becoming a lot more irritable lately. Since his birth – he’s been circumcised at 21 days old, has had two haircuts – ehem shaves, numerous nail clippings and countless nappy changes. At the beginning, I was trying to figure out his sleeping schedule so I can work around it… and just when I thought I had figured it out we both end up getting ill on and off all the way from December to early February. These months were super hectic and draining because it totally flipped his sleeping schedule around and it was super hard trying to get it back to a manageable time frame. He literally slept 20-45mins at a time and then would wake up – it was so exhausting it definitely took its toll. Fast-forward to now, as soon as he passed the 6-month date exactly it was like he fell into the most beautiful routine and now sleeps through the majority of the night ALHAMDULILLAH – well 10pm till 7/9am. He will wake up once (approx 1am) but I tend to pat him back down to bed. It’s been super lovely since this change and I’m in a much more positive and happier mood having slept considerably well. This means I’m able to put that much more of an extra effort towards Isa in the day and fully immerse all my joy into him. Plus it means I have more time to edit and blog for you guys! Throughout the day he will have 2 naps varying from 30 minutes – 1.5 hours. Depending on what we do in the day it could sometimes be three naps. Don’t worry, I will write up a current detailed routine post that I have going on for Isa in an upcoming post – a routine in which I believe has helped him to sleep comfortably throughout the night. On a side note, we’ve noticed that when he sleeps on his stomach he sleeps the longest. Oh and when he sleeps on our bed he sleeps the soundest and the longest also – not sure if our smell that is lingering on the duvet is comforting? This is possibly the most depressing part of motherhood that probably kickstarted my anxious, frail mental state to fall into a whirlwind. Having had an uncomfortable pregnancy with the addition of gestational diabetes throughout – I was taught the importance of breastfeeding. What sounded like such a beautiful bonding experience was immensely tough for me to get along with. 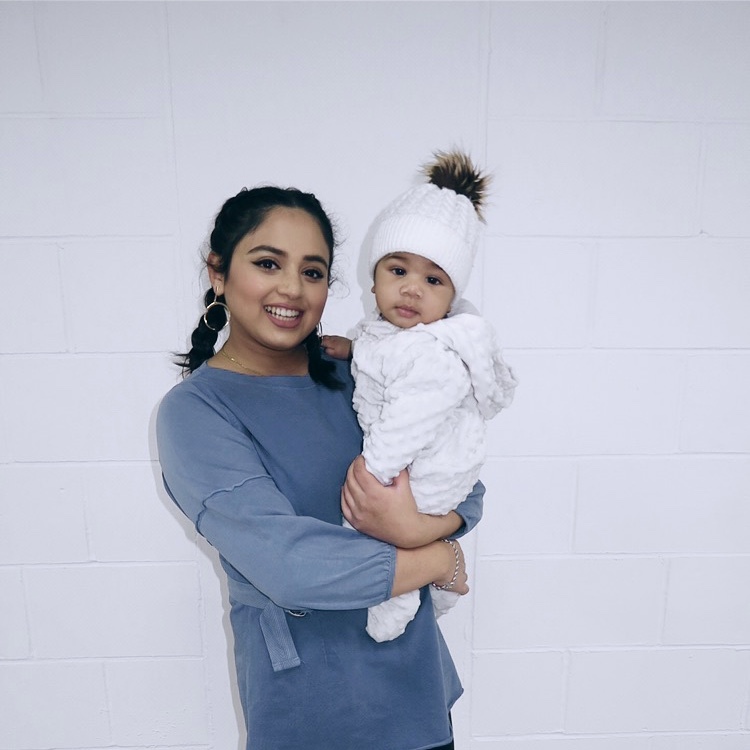 I failed to latch my little one on to me… ultimately I felt like I had failed as a mother before motherhood had even begun. I understood the importance of breastfeeding and all the nutrients and goodness Isa would have received from me… but I just couldn’t do it. Eventually, the pressure along with other factors was too overwhelming for me so I stopped. What should have been a natural experience became the most unnatural thing for me to do. I did try numerous times to get Isa to latch on but ended up getting into a bad state where I found it difficult to breastfeed him and was super harsh on myself for it. Eventually, I knew for my own mental health and happiness I needed to get over the fact that I lost this battle and just regain my thoughts emotions and wellbeing so I could be there for him in other ways. Thus the journey into formula feeding began. I used Aptamil 1 First Milk ready to feed milk – which was literally ready made milk, ready to go… purely for convenience sake – all I had to do was warm it and plus it was easy to travel with. However, I noticed that he was regurgitating and throwing up a lot of milk, so I did change his formula up a couple of times across different brands and types. In the end, we kept to Aptamil 1 Anti-Reflux milk powder as there was a significant change since swapping him over – he hardly pukes up with this stuff. Oh boy, it’s happening alright. Anytime anyone is eating Isa will stare, walk towards you or will grab your arms/ hands towards him and try to nibble on whatever you’re having. It’s quite cute, to be honest. He’s been dribbling a lot, likes to bite his fists and onto some of his teething rings. We have good days and some bad days where he will throw a mini tantrum and I know it’ll be from the pain… those days can be quite tough but once soothed he’s not too bad. When I do see him fussing like that I’ll give him a cold cucumber to nibble over. It’s all a bit of waiting game at the moment as we’re just patiently waiting for some teeth to pop through so then I can start feeding him mini meals! As soon as he was 4 months I started to introduce solid foods to him in the form of Aptamil Baby porridge. It didn’t go down to well and from his facial expressions I imagine it was too bland and he had a funny tummy (poo), so I stopped for a week and then slowly reintroduced it to him in the form of Ella’s pouches which he took to it very well. Since then he’s had a variety of pouch foods, all organic – from either Aldi, Ella’s, Piccolo or Hipp. He’s enjoyed all of them to be honest (I buy what’s on offer). He knows what he likes and has his favourites – banana, mangoes and carrots and definitely has his dislikes from parsnips, to mint and to even peas – bless him, little man was fully gagging on those flavours so I would try to mask the taste/scent by squeezing a bit of banana puree on top (cheeky, I know)! Now that we’re at the 6-month stage I’ve given him more solid like foods from Farley rusks, to Ella’s puff, cucumbers, lemons and grapes. I mainly give them to encourage baby led weaning (I think that’s what it’s called) and to build his hand-to-mouth coordination. Moving forward I would like to introduce him to Weetabix as I know the fibre will be beneficial and will be more filling for him. Moreover, it’ll be much more economical. Initially, the pouches were a convenient way for me to test what flavours and textures Isa likes so now that I know I intend to be steaming/ cooking them for him at home, wish me luck! I will however continue to keep a stockpile of pouches as they’re super handy for a day out. No crawling – we’ve got hardwood floors and haven’t been putting him on the floors as much as we would’ve liked. We’ve had him lay on the bed a couple of times to encourage his crawling but we understand it’s not the same and he’s not building up the strength in the right places. Having said that he is starting to roll around all over the place, it’s scary to leave him anywhere alone for a couple of seconds. Whereas before he was a bit of vegetable and could be left anywhere. We are currently encouraging crawling by laying out his toys on top of a fur throw for him to wriggle around on. It’s been reported by his dad that so far so good. Now walking is where Isa aces the test. Stick him in his little walker and he’s thunderbird go, go, go. He zooms all over the place, it’s sooo cute and funny. Everyone’s been commenting how he’ll be a fast learner and walker In sha allah. Not quite, but I swear I’ve heard him say AMA (mom in bengali). OH and he loves it when I read dua’s (prayers in arabic) over him – he’s very responsive in that sense. Lately, he’s really been trying to engage in conversations with a few ooooh’s and ahhhh’s here and there. It’s lovely to hear him babble and in response to his babbling conversations I too will babble back, hehe. At birth Isa fit into newborn clothing and nappies, weighing in at 7lb and .5oz. I’ve not taken Isa to a weigh in since his 2month weigh in (and you’re supposed to take them every month), lol. It’s quite a tedious process and in my area, it’s only done once a week at the local community hall and the slot is so awkwardly placed in the afternoon. In which Isa is usually having a nap, and since December we’ve both been ill so it’s not gone to plan. Despite that, he fits comfortably in 6-9 month clothing and size 4 nappies – so based off of that I’m not too worried about anything in particular. Do not buy toys for the at least the first 6 months of a baby’s life. A) they won’t recognise it B) they won’t play with it C) they like the stuff that’s free (i.e. carrier bags – yes it’s supervised) or the stuff around them. Isa has accumulated quite a few toys, many of which were gifted, however, he only plays with two things. That’s his rattle (which I use before bed to soothe/relax him as it sounds like waterfalls) and this rattle chain thing where I put together a bunch of these jungle gym toys together on a D ring which is great for his current teething state. But more than anything Isa is so content with his muslin cloth! Give him one of those and he will fiddle it with it, stare at it and lick it for ages! THAT’S THE OVERALL ROUNDUP CONCLUDED. I think I’ve touched upon the main topic a baby update post contains and I plan to do one for 9 months, so if you have any questions let me know and I’ll do my best to answer them there! Oh, and my next post due to go live, is my 6-month update post because it’s important as new moms we check in on ourselves and other aspects too, so I do hope you’re looking forward to that too! HAUL || THE £2.00 CHARLOTTE TILBURY SEDUCTION ALTERNATIVE? LIFE // 6 MONTH UPDATE, Mommy Edition.